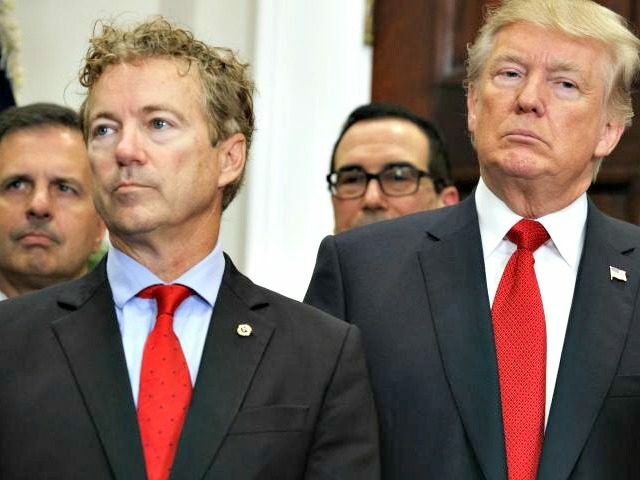 Sen. Rand Paul (R-KY) on Thursday called for an investigation about “high ranking Obama government officials” who might have worked together to stop the election of President Trump. Paul’s call adds a high-profile voice to the chorus of Republicans who are calling for a special counsel to investigate whether Obama officials tried to stop Trump’s election, in the face of mounting evidence. So far, congressional investigators have found out that the Hillary Clinton campaign and the Democratic National Committee paid for the Trump dossier, through their law firm Perkins Coie. Clinton campaign and DNC officials have denied knowing about it. Perkins Coie initially denied funding the dossier, before they were forced to admit it after the House intelligence committee subpoenaed for financial records. The dossier was then given to the FBI in the summer, when the FBI’s investigation into the Trump campaign began, and when it applied for a surveillance warrant to spy on Trump campaign adviser Carter Page. Congressional investigators are finding out whether the dossier — an unconfirmed piece of anti-Trump opposition research — was used as evidence to launch the investigation and get a spy warrant. There are also reports that the FBI reached an agreement to pay the dossier author, Christopher Steele, and did end up reimbursing some of his expenses. Steele reportedly paid some of his sources, including Russian intelligence officials. So far, the dossier’s accusations of collusion have not been verified. Also during that time, over at the Justice Department, a senior DOJ official, former associate deputy Attorney General Bruce Ohr, met with the dossier author and Fusion GPS, the firm that produced the dossier. In addition, his wife Nellie began working for Fusion GPS. Ohr reportedly obscured those connections from his superiors at the DOJ until recently, resulting in a demotion. Around that same time, senior FBI official Peter Strzok — who played a major role on the Clinton email investigation, watered down language that exonerated her from wrongdoing, and signed off on the FBI’s initial Russia probe — discussed in deputy FBI Director Andrew McCabe’s office the possibility of Trump’s election. “I’m afraid we can’t take that risk,” he had texted another FBI official with whom he was having an extramarital affair. He was later assigned to Robert Mueller’s special counsel, but was removed in July over those and hundreds of other anti-Trump texts. As Republicans in Congress have learned these revelations, Democrats have tried to bring attention to Robert Mueller’s special counsel, arguing that Republicans and President Trump are trying to shut it down, despite him recently saying he had no intention of doing so. Recently, the top Democrat on the House intelligence committee, Rep. Adam Schiff (D-CA), argued that there is already proof in “plain sight” that the Trump campaign colluded, and the special counsel had to continue, in order to prove it beyond a reasonable doubt.